We were recommended by friends of ours and have since bought 2 investment properties with the guidance of RPM. Both were rented out quickly and we are currently discussing increasing our portfolio. We’re very happy with the ease of everything and have made over $100k in profit. We were wondering how to eliminate our mortgage, especially getting closer to retirement. After talking to RPM, our mortgage is going well and truly down, and in the next 12-18 months we hope to wipe it out completely. RPM have fine staff that deserve a pat on the back. They helped us to buy an investment property which is fantastic, and we are definitely looking forward to home ownership. We were sceptical at first, but once we spoke with Lloyd, our minds were at ease. We never felt like we were going to be mortgage free, plus our supers were only slowly increasing and with our retirement ages getting closer we knew that there had to be a better way to create flexibility and security for our futures. The expertise, help and support of RPM made buying an investment property and adapting to a better mortgage strategy an easy, painless process. It’s certainly working for us. We cover all aspects of property management, from completion and handover of the property, through to ongoing maintenance and management. Being part of the building company, we have the advantage of insight into building completion times and dates. Our focus on customer service to both the owner and tenants is our point of difference. We ensure that the property is well looked after and any issues are rectified effectively and efficiently. We carry out regular inspections, and promptly take care of any property maintenance, both within or outside of warranty. We were looking for someone to help us manage our money and reduce our mortgage faster. So we put our trust in RPM, everything was communicated really well and done for us and it just felt rights. The staff are really helpful and answer all of our questions, and with their guidance in 3 years we have paid off our home, and purchased 2 investment properties. We feel like we have won the lottery. Even as a property owner with no mortgage, I never took the necessary steps to offset my tax and improve my wealth for retirement through property investing. It has been a phenomenal experience investing in property with the assistance of RPM. They have been great, one phone call and everything you need is being taken care of. They are a great family business and are all there to help you achieve your goals. My advice to others is to have a chat to RPM. We were recommended to RPM by my parents and it’s been an eye opening experience. Looking at our mortgage and super balances we knew we needed to take control, and find a smarter way to do things. Now we are on the way to having our mortgage paid off in 4 years, with 2 investment properties for our retirement, providing great tax rebates which we weren’t aware of. The support from RPM can’t be measured. Being a family business, it has that comfortable family feel. Our advice to others would be to stop wasting your time and money and speak to RPM. My wife, being a police officer was sceptical, so she was happy to know that RPM have a number of police officers as clients. She even interviewed them all and heard great reviews about RPM and the service they provide. We didn’t have to do any research, it was all done for us, very easy and hassle free. And it made sense to use a professional to do all the work. Our tax benefits are huge which is great and we have noticed a massive reduction in our mortgage. We have now bought our 2nd investment property, which we instigated with RPM. They suggested one first which made us feel so at ease with them. And we want to keep building on that. We didn’t have much in super, so wanted to find a way to secure our retirement. We were referred by a colleague and have never looked back. When we bought our first investment property there was someone there with us every step of the way, both during and after hours. We were explained everything in detail and the girls in the office are great. We’ve never had a problem securing tenants for the property, Lloyd said RPM source great locations that will always attract people and he was right, people were queuing to lease the property, so we had numerous applicants to choose from. We feel really comfortable with RPM and are excited about buying our 2nd property. We were stuck in a mortgage rut, and wanted to find out how we could reduce it faster. Rpm have helped us with that and have been very positive, their staff are open and helpful, and now we hope to retire early. I would recommend to anyone to jump on board, as most people these days have big mortgages. This gives you control over your mortgage, and allows your future to look bright. We were told to see RPM by a friend about how to go about investing into property. RPM have been great to deal with, it has been the best business dealing we’ve ever had and the best investment we have ever made. We are really happy with how quickly the property was tenanted, they are quality tenants and are still in the property. And since we bought the property in 2014, it has grown in value by about $100,000. We would certainly invest again and refer others, which we already have done. We were recommended by friends and have never looked back. The service and experience has been really good; we would advise others to come and see RPM and realise what you really can achieve. Our mortgage has gone down already, which is the immediate benefit and the property investment is the long term benefit. We will look at growing our portfolio again in the next 18 months and would absolutely refer others. I saw a flyer at work and a testimonial from one of my colleagues, so decided to go and see RPM. RPM are very helpful, informative and supportive. The team literally did everything for us, we pretty much sat back and did nothing. We were skeptical at first but after looking at all the information RPM provided it all made sense. We would definitely build our portfolio further if the opportunity arises and will refer others to RPM. Lloyd and the crew have looked after me very well. The team are all so personable. They have a genuine interest in looking after me and my investments. I also had no problems renting the property and am actually receiving 20% more than I had calculated and my property has f grown in value by 50,000 in less than 12 months. I feel very comfortable about my future and am in a far stronger position now than I was previously. We have purchased 2 properties with the guidance of RPM and didn’t have to micromanage anything, it has been a very seamless and stress free process, a turnkey set and forget. We are very impressed with the homework done, the premium locations and block sizes for the price. Lloyd has been fantastic and we can call at any time. RPM and the staff are very effective and proactive at all times. We would definitely refer others. Our experience with Lloyd and RPM has been very enlightening, Everyone at RPM has been amazing, it has always felt like we have known them for years. We have referred all of our family and they have all done extremely well and are very happy. RPM has made a massive difference to our retirement, it has certainly taken the pressure off. And their honesty and integrity is amazing. RPM have used their considerable knowledge in wealth creation strategies to provide my wife and I with considered and proven guidance that have allowed us to invest in our first property. 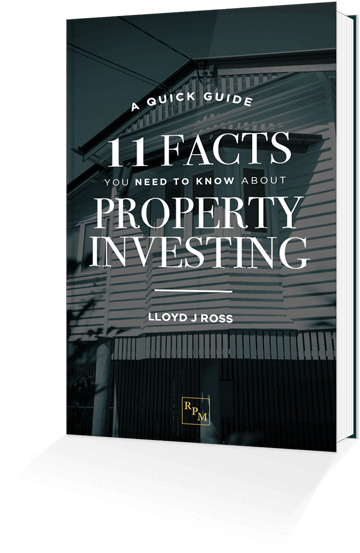 RPM organised everything and provided us with easy to understand instructions on how to successfully invest in a property without falling victim to the many potential traps that occur when investing for the first time. RPM has made our foray in to the property market a worthwhile and painless endeavor. I would like to extend my thanks to RPM and look forward to a continued relationship with them. I will continue to recommend RPM to friends and family. We have been associated with RPM now for the past 6 1/2 years after recommendation from a relative. Using the equity in our own family home enabled us to buy an investment property in Springfield Lakes through RPM. The value of that house has doubled in value enabling us to reinvest in yet another investment property. We are happy to say that our own home is now mortgage free and our first investment is well on the way to being debt free. We have been very happy with the professional service that RPM has provided, being there for you whenever there is a query and dealing with the very capable and reliable staff makes things easier. We have been clients with RPM for more than 2 years and found them to be very reputable and professional company. RPM is customer focused and has made it possible for us to enjoy financial freedom and build our investment properties portfolio (three investment properties) with professional integrity.If we had any queries, RPM has responded immediately both professionally and efficiently. We have no hesitation in recommending RPM to any prospective client. You will find that RPM works for you. Since 2003, my wife and I have been under the astute guidance of the RPM team. Over the past 10 years, we have built a portfolio of three investment properties which has enabled us to significantly reduce the mortgage on our home, and also provide us with financial security for the future. This has also significantly reduced our tax and increased our cash flow. We cannot recommend the talented people at RPM highly enough. My wife and I were recommended to discuss means of reducing our tax, while building wealth and investing in rental properties by our accountant – his recommendation was we talk to RPM. Being people who are quite cautious with our finances, we were a little skeptical at first; however we made an appointment with RPM some 3 years ago, and literally have not looked back since. We are well on our way to paying off what was a substantial mortgage on our primary place of residence, while massively reducing our tax. RPM made it possible by doing all of the hard work with their integrity and professionalism at every step of the process. We were skeptical at first, but once we spoke with Lloyd, our minds were at ease. We never felt like we were going to be mortgage free, plus our supers were only slowly increasing and with our retirement ages getting closer we knew that there had to be a better way to create flexibility and security for our futures. The expertise, help and support of RPM made buying an investment property and adapting to a better mortgage strategy an easy, painless process. It’s certainly working for us. My wife, being a police officer was skeptical, so she was happy to know that RPM have a number of police officers as clients. She even interviewed them all and heard great reviews about RPM and the service they provide. We didn’t have to do any research, it was all done for us, very easy and hassle free. And it made sense to use a professional to do all the work. Our tax benefits are huge which is great and we have noticed a massive reduction in our mortgage. We have now bought our 2nd investment property which we instigated with RPM. They suggested one first which made us feel so at ease with them. And we want to keep building on that.